Our name ‘ Paradee ' means the “ Sixth Heaven ” … absolute … luxurious … splendor … in a private world complete with your own pool and romantic outdoor bath. We offer you not one, but two secluded Palm-fringed beaches … one dazzling white in the sun with crystal aquamarine waters … the other abundant with coral. From the time your speedboat glides toward anchor in Paradee, you will be spellbound by this location which few resorts in the world can equal. Your every wish is our command. Expertly crafted real wood lounges will be placed wherever you wish in the sun or under a swaying palm. Here, the beach is your world … a haven away from the tourist throng. A paradise unto yourself. - Presently applicable service charge, VAT and government taxes. - Welcome drink at Sunset Bar on arrival date during 17.00 hrs - 22.00 hrs. 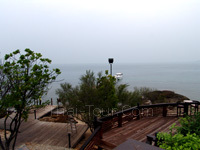 - Admission fee to Khao Laem Ya-Mu Koh Samet National Park. - The special rates applicable for F.I.T. Booking (Maximum 5 rooms per booking) only. - THe special rates applicable to new bookings only, CANNOT RE-BOOK. - The above special rate can NOT combine with other promotions and benefits. - Please mention "HOT DEAL PROMOTION" in your voucher when make the reservation. - The above special can Not combine with other promotions. - Please mention "Last Minute Promotion" in your voucher when make the reservation. Note : Special rates cannot apply on high occupancy date and subject to room available. - Please mention "SPECIAL RATE MINIMUM 2 NIGHTS" in your voucher when make the reservation. * FREE breakfast on free night. * Extra bed can apply on bonus free night. From Paradee Office (Jadet Pier, Mainland): 14:00 hrs. and 17:00 hrs. From Paradee (Koh Samet) : 11:00 hrs. and 13:00 hrs. • Presently applicable service charge, VAT and government taxes. • Daily American breakfast. Welcome drink at Sunset Bar on arrival date during 5PM – 8PM. • Afternoon tea serves in the villa. 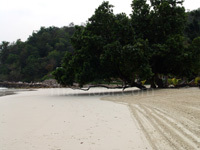 Admission fee to Khao Laem Ya-Mu Koh Samet National Park. • Complimentary a bottle of wine in villa on arrival date. • The rates applicable for World Wide Market (Except Korea). • Early Bird Discount based on room rate includes breakfast as per main contract rate. • The special rates applicable to new bookings only and CANNOT RE-BOOK. • Other terms and conditions as per main contract rate. • The above special rates can NOT combine with other promotions and benefits. • Please mention “COMBINE PROMOTION” in your voucher when made the booking. From Paradee (Koh Samet): 11:00 hrs. and 13:00 hrs. • Welcome drink at Sunset Bar on arrival date during 5PM – 8PM. • Afternoon tea serves in the villa. • Admission fee to Khao Laem Ya-Mu Koh Samet National Park. • Please mention “EARLY BIRD PROMOTION” in your voucher when made the booking. • The rates applicable for ALL MARKET. • Please mention “SPECIAL RATE MINIMUM 4 NIGHTS” in your voucher when made the booking. Drinks : Unlimited soft drinks, cocktail, local beer, and house wine by glass (Not bottle). • If guest arrives after lunch time (Official Check-in time 2pm) the lunch will be compensated with lunch on departure date. From Paradee office (Jadet pier, mainland): 14.00 hrs, 17.00 hrs. 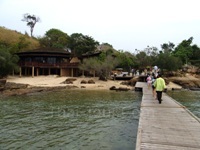 From Paradee (Koh Samed): 11.00 hrs, 13.00 hrs. • Minimum 4 nights stay during 20 December 12- 10 January 13 is required as well as hotel reserves the right to refuse the reservation even inside allotment which check out on 31 December. 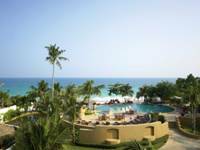 Stay a minimum of consecutively 3 paid nights, get additional 1 night free on room only i.e. 3+1, 6+2 The compulsory ABF is chargeable to the rate. This special offer is applicable for Garden Villa, Garden Pool Villa and Beach Front Pool Villa. 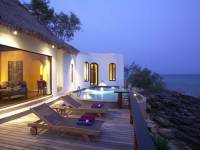 - Stay 3 nights upgrade to next category, maximum at Beach Front Pool Villa. - Presently applicable service charge, Vat and government tax. - Welcome drinks & snack with complimentary wine, afternoon tea serve in the Villa. - Admission Fee to Khao Laem Ya - Mu Koh Samed National Park, Parking at Ban Phe. • One Child under 4 years old, accompany the same room with parent without extra bed is complimentary on ABF. Other meals to be charged at 50% off contract meal rates. • One Child 4 -12 years old, accompany the same room with parent without extra bed is free of charge on room only basis. All meals to be charged at 50% off contract meal rates. • Second child under 12 years old, accompany the same room with parents will be charged at one adult extra bed and all meals to be charged at 50% off contract meal rates. • Note: Transfer(LAND&BOAT) prices are subject to change without prior notice. • Any cancellation must be made in written notice or email to us within 30 days prior to arrival date.